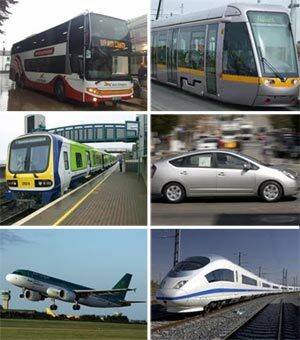 In my previous post (Against High Speed Rail) I questioned the wisdom of investing in a High Speed Rail (HSR) system in a world facing an impending energy crisis. Ultimately, if we wish to maintain a society in which travel is relatively easy and affordable, then we need to be investing in the most energy-efficient transport infrastructure available. And while HSR is more efficient than private cars or air travel, it is less efficient than conventional rail or coach travel (and significantly less efficient in the case of coaches). It’s this specific statement I wish to address right now. You can read my response to the rest of Ryan’s comment beneath the previous post (here). Also, I should be clear that while Ryan posted the comment to my blog, he is essentially putting forward a widely held view. So my response is not necessarily directed at him personally but is intended to counter that mainstream position… that the decline in conventional crude oil can be offset by a rise in non-conventional oil production (or other energy sources). It’s a position that cuts right to the heart of peak oil theory and one where the technical issues are not widely understood. Let me start by suggesting that if someone doesn’t “see too many signs of this energy crisis arriving any time soon”, it may be because they’re not actually looking for the signs. I have been looking for them and I can confidently say that they are there. Quick survey: raise your hand if you have read any feasibility study carried out into the exploitation of tar sands and their ability to mitigate a decline in conventional crude oil? I’m fairly confident that you don’t have your hand raised, dear reader, though perhaps I’m doing you an injustice? The reason I ask is because that’s the sort of place where “signs of this energy crisis” can be found. They tend not to show up in the mainstream media (on the rare occasions they do, they’re well-disguised) and even when they appear in market signals they are dismissed with inaccurate explanations because they fail to fit an existing narrative. But I want to avoid media and market analysis in this post as much as possible, and concentrate on the technical details, so I’ll just say that if you’re not reading the technical literature on the subject (like almost everyone on the planet) then it’s no surprise you don’t see the signs. Before I get into the details of tar sands (which I will take as my basic case study, but a very similar post could be made about shale gas, while Arctic oil has problems of its own), let me say a few words about the difference between conventional oil and non-conventional. Because it’s pretty important to get your head around it if you want to understand why it is that although the “massive quantities of tar sands” may exist, they are not quite what they seem. Over the past hundred years or so humanity has consumed a lot of oil. At a rough estimate, about 1.5 trillion barrels of the stuff. That’s a huge quantity make no mistake. And of that, the vast majority has been what we call “conventional” oil. Unfortunately that’s a bit of a slippery term as it’s used both as a classification of oil, and also to describe the source of the oil. So, in the first instance conventional oil is a combination of crude oil and condensates which can be fed directly into conventional oil refineries to produce petrol, diesel, jet fuel, etc. Generally this stuff is sourced from shallow water (less than 180m) and land-based wells. Unconventional oil is stuff that cannot be fed directly into conventional refineries and requires pre-processing of some kind. So we’re talking about tar sands, shales, gas-to-liquid products and coal-to-liquid products. Complicating matters a bit, however, is the fact that the term “unconventional” is sometimes applied to oils that are sourced in deep water wells and Arctic regions despite the fact they can often be fed directly into conventional refineries. The thinking behind this classification is that both deep water and Arctic wells involve levels of expense (both financially and in energy expenditure) that place them closer to unconventional sources from both an economic and energy-return perspective than they are to – for example – crude oil from a Saudi land-based well. Complicating matters even further is the fact that deep water oil is sometimes chemically different to shallow water oil due to the additional pressures involved. Therefore, to simplify matters it is normal to classify deep water and Arctic oil as unconventional along with tar sands, etc. Whether you agree or disagree with that classification isn’t really important so long as we clearly define our terms up front so everyone’s speaking the same language. And it’s important because when we talk about peak oil, we are talking about an initial peak in conventional oil production followed by a subsequent peak in overall production. This detail almost never makes it into the occasional peak oil stories that appear in the mainstream media because… well, because the mainstream media has a pathological aversion to covering anything of importance in enough depth to actually explain the issue properly. The assumption is that the public is basically a bit thick and possesses the attention span of a gnat. And given the reading habits of the public and the way they vote… that may not be an entirely unjust assumption. But I digress. If you read the more scholarly of the peak oil theorists (such as Dr. Colin Campbell of ASPO) you’ll find they tend to suggest that we can expect a peak in overall oil production between 10 and 15 years after a peak in conventional oil production. And given we now believe the peak of conventional oil was in 2006 or thereabouts (the International Energy Agency suggests it was 2009, but their optimism is renowned) we should prepare ourselves for the peak in conventional plus unconventional*. The reason for the lag of course, is because unconventional sources – such as tar sands, gas-to-liquids and biofuels are indeed coming on stream to meet a rise in demand that can no longer be met by conventional oil. “But why”, you may ask, “can unconventional sources not continue to rise in line with a decline in conventional production? And why does conventional production need to decline right now anyway?”. After all, don’t peak oilers admit that we still have as much conventional oil underground as we’ve used in the past 100 years? Well, that’s true. A peak in conventional oil production means we probably still have about 1.5 trillion barrels of the stuff accessible to us. And when you add that to the new unconventional sources just coming on-stream now (those “massive quantities of tar sands” for example) it seems absurd to suggest that we’ve reached one peak and are nearing the next. And yes, it does seem absurd. That is, unless you know something about petroleum geology and the engineering challenges surrounding the pre-processing of unconventional oil sources. Most people don’t. Through a quirk of fate, I know a little. 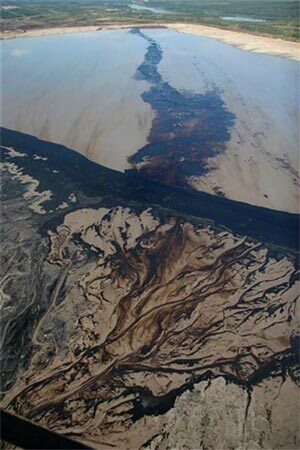 Let’s take tar sands as an example. Ryan uses the phrase “massive quantities of tar sands […] which suddenly look economically viable”. Now, it’s worth pointing out that strictly speaking I dispute the notion that they are economically viable, though they can be made look that way (in the same way as sub-prime mortgages looked economically viable for a while) but I’m going to ignore that in this post. For the sake of discussion, let’s concede that they are indeed “economically viable” (i.e. some people might make a profit out of their exploitation, which – when all is said and done – is what that phrase means). It’s neither here nor there really, because they suffer from two huge flaws which makes them completely inadequate for filling the gap left by diminishing conventional oil production. You see, despite having only extracted half the conventional oil from the ground, we cannot produce the remaining half at a rate of our choosing. As much as some economists might like to dispute this fact, oil production capacity is not exclusively determined by market demand. A drop in demand will certainly see a drop in production. But a rise in demand is not necessarily followed by a rise in production. Historically speaking that has been the case; and economics – of course – is essentially the mapping of past behaviour onto the future, so it’s no surprise economists believe rising demand will lead to rising production (for years the IEA merely relabelled demand forecasts as production forecasts!) However, when circumstances change within the physical systems upon which the economic system is based, then the historical model no longer applies and economics as a discipline gets blind-sided. This also explains why the markets are so bad at relaying the signs of the looming crisis… on the rare occasions those signs manifest, they get relabelled as something else. But the physical systems have changed, and this has not been incorporated into the models used by economists, and by extension, those used by policy-makers. The geology of oil fields combined with the physics of fluid dynamics place certain limitations upon how fast we can pump the stuff. And crucially, once we have extracted roughly half the oil from a given field, the rate at which the rest can be extracted begins to steadily drop. This is simply down to internal field pressure. And while this pressure can be increased to an extent by pumping gas into the field, it should be noted that, with very few exceptions, Enhanced Oil Recovery (EOR) techniques** are already being used in every major oil field where they might be helpful, and have been for the past couple of decades at least. Interestingly (and perhaps worryingly) while EOR can sometimes increase the amount of oil recoverable from a field, it also succeeds in recovering the stuff faster. So once half the oil has been extracted from a field without EOR, it might see a 2% per annum decline due to a drop in pressure. But for fields that make intensive use of EOR (i.e. almost all of them) that decline could be as much as 6% per annum post-peak (it varies from field to field). This is not a trivial point when it comes to the question of how far unconventional sources can make up for a drop in conventional. So that’s one half of the picture… sometime between 2006 and 2009 (depending on whose figures you accept) we reached a peak in conventional oil production. That global peak may one day be represented as a 3 year plateau, or a 5 year plateau, or something like that… by definition the height and length of the peak can only be accurately described in retrospect. What we do know, however, is that during this peak in conventional oil production, unconventional sources are having great difficulty meeting additional demand. As a result, oil prices are rising once again. Of course, oil price is determined by myriad factors of which production levels is but one. However, it is my contention that the situation in Iran – as one example of what’s being blamed for the price volatility – is, in part at least, an example of the “relabelling” I mentioned. In November 2011 OPEC increased output marginally – mostly down to Libya’s production coming back up to speed – but still managed to squeeze out less than a million additional barrels per day despite a huge effort and despite rising demand – the world is currently consuming about 90 million barrels per day (mb/d). And we know that this increase failed to meet demand because global industry stock (strategic reserves of already-produced oil) declined steeply in October and November. So why are unconventional oil sources not ramping up to meet increased demand? Let’s assume we don’t give a damn about the environmental consequences of our resource consumption. We do, of course, because the species that destroys its environment destroys itself. But for a moment let’s forget the fact that tar sands have been (accurately) described as the most environmentally damaging source of oil known to man. This photograph is of one of the numerous “tailing ponds” springing up in the Alberta region of Canada as they exploit their massive reserves. These lakes of effluent are growing rapidly and nobody seems very sure what to do with them (best not to do an Image Search for “betting tipstar sands” if images of ecological madness freak you out). But for now, although we don’t care about that, it might be worth bearing environmental consequences in the back of our minds as we compare the processes of producing a barrel of oil from Canadian tar sands to the process of producing a barrel of Saudi crude oil. 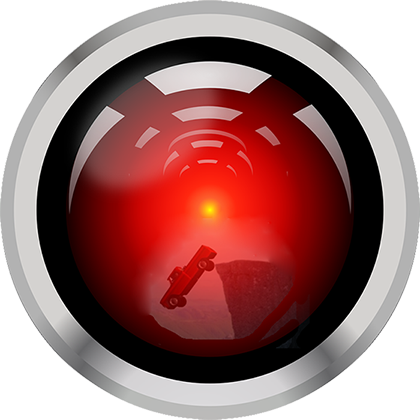 In the case of the Saudi oil, we drill a hole into the ground above the oil field. The internal field pressure then pushes the oil up to the surface where we catch it and send it to refineries. After a while the pressure drops a little and we expend energy to pump gas into the field and keep the oil flowing. Ultimately we get far more energy from the oil gushing out of the ground than we consume during the drilling and refining processes. If it weren’t for the crap produced when we burn the stuff, it’d be free energy near as dammit. With tar sands, the first part of the extraction process generally consists of chopping down a forest. After that’s been done, we begin the extraction not by drilling, but by mining. It takes approximately two tons of tar sand to produce every one barrel of oil. And in order to access the two tons of tar sand, we must first excavate roughly two tons of soil and peat. We then need to heat three to six barrels of water (this heat tends to be generated by burning natural gas) which is passed through the tar sand to remove the bitumen. That polluted water is what makes up the growing tailing ponds. Three to six times the volume of the oil produced. So I’m sure you can see the fatal flaws, right? Canada has by far the largest unconventional oil reserves. By 2030, in a very optimistic scenario, Canada may produce 5 mb/d. Venezuela may perhaps achieve a production of 6 mb/d. Who will be the producers of the remaining 26 mb/d? It is obvious that the forecast presented by the IEA has no basis in reality. Likely impact of Canadian tar sands (in red) on global oil peak. As if that weren’t enough, it’s worth mentioning that the ERoEI (Energy Returned on Energy Invested) for tar sands currently tends to be between 1.5 and 4 (industry forecasts suggest it might rise as high as 7 when the process is running at maximum efficiency). That’s as compared with between 30 and 100 for conventional crude. So even taking a best-case tar sand versus a worst case crude, the net energy content of a barrel right now is between 7 and 8 times less. And even if industry forecasts are correct, that number won’t dip much below five. And then there’s the second fatal flaw with tar sands. Exactly where is all the fresh water and natural gas required to process the stuff going to come from? These are not superabundant resources. Not any more at least. And a significant acceleration of tar sands production will have a very serious impact on Canadian water tables and gas supply. When Uppsala University describe Canadian tar sand production as reaching 5 mb/d as being “very optimistic”, they are being very generous. Alberta’s natural gas production has already peaked. So in order to ramp up production of tar sands – even by a little bit more than the current 1.5 mb/d – Canada will have to export less gas to the United States. And this presents serious economic and legal problems given the terms of NAFTA and the long-term contracts into which Canada has entered. And natural gas supply may not even be the major constraint. Currently (at 1.5 mb/d) the Canadian tar sands industry is draining in the region of 50 billion gallons of water from the Athabasca River every year. That accounts for about 10% of the total water consumed by the North American oil industry. From a water perspective it is staggeringly inefficient, and is roughly 30% of the water that environmental surveys suggest is available for use and for which they are licensed to use. 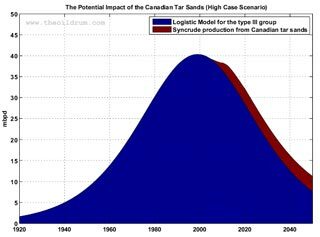 So there are very good reasons to suggest that Canada’s tar sands production can never rise above 4.5 mb/d and is likely to remain significantly below that level. So don’t believe the mainstream media hype about the “massive quantities of tar sands” and their role in making up for losses elsewhere. It doesn’t matter if there are 1.7 trillion barrels of the stuff in central Canada. The fact is that due to well-understood if under-publicised physical constraints, it seems extremely unlikely those sands will ever be capable of providing more than about 4% of current demand (and a far smaller proportion of forecast demand). And given how much hope is being invested in those sands to mitigate our looming oil shortage, I would suggest, that’s a pretty clear sign “of this energy crisis arriving soon”. * My reading, incidentally, is that non-geological factors will ensure the overall peak happens a little earlier than 10-15 years after the conventional peak. For about 12 years I’ve been calling the overall peak at 2015 (plus/minus 5 years) and in principle I stick to that. But I’m now suggesting that estimate can be refined a little and believe we can say it’ll be plus 3 /minus 4 years. Sometime between this year and 2018. ** Gas injection is just one of a variety of EOR techniques.